Today was a great day for our campers! The dancers are working hard in preparation for their rehearsal tomorrow afternoon, and the younger kids are already beginning to memorize their lines. We are even more excited about the multiple opportunities we have had to share the Gospel with the kids. It is great to hear children so young excited about Jesus! 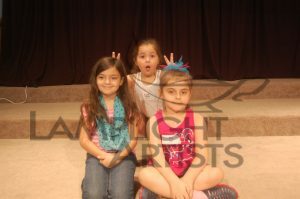 Our three brave soloists are practicing night and day to get their solos just right, and each child continues to warm our hearts with their unique personalities. Until tomorrow!